Ted Jordan’s VTL transmission line remains our most popular enclosure for the Eikona 2 full-range loudspeaker. It is a compact,floor-standing design which is 30 cm wide but only 10 cm deep and very room-friendly. 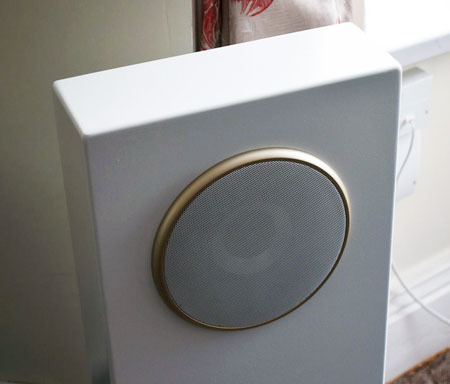 It is perfectly happy working near walls and room boundaries and is a neat solution to high quality music in the home. “I listened to a selection of my test tracks to listen for various different aspects of the sound quality. … Being a single driver speaker with no crossover to muck things up, the clarity and transparency are crystal clear and uncoloured. The stereo image and focus, even with just a few feet between the speakers, is superb. “I must admit to be a bit in awe as to what a 4” driver is capable of; these things reproduce percussion unlike any other speaker I’ve heard, drums and rim shots are so crisp and powerful, it’s a revelation, as for bass, these transmission line cabs just can move so much air, it seems like alchemy! Part 2 looks at the background to Ted Jordan’s VTL enclosure. Meanwhile you can see the plans here. Tagged Eikona 2, transmission line loudspeaker, VTL.